This is the fourth and final installment in the Smögen Sherry Project. A fun project where we as consumers can see for ourselves what effect an increased sherry influence will have on a young whisky. The first one had a 4 months sherry finish, the second 8 months, the third 14 months, while this last one is fully matured in 1st fill sherry quarter casks (cask #25-27, and 29). 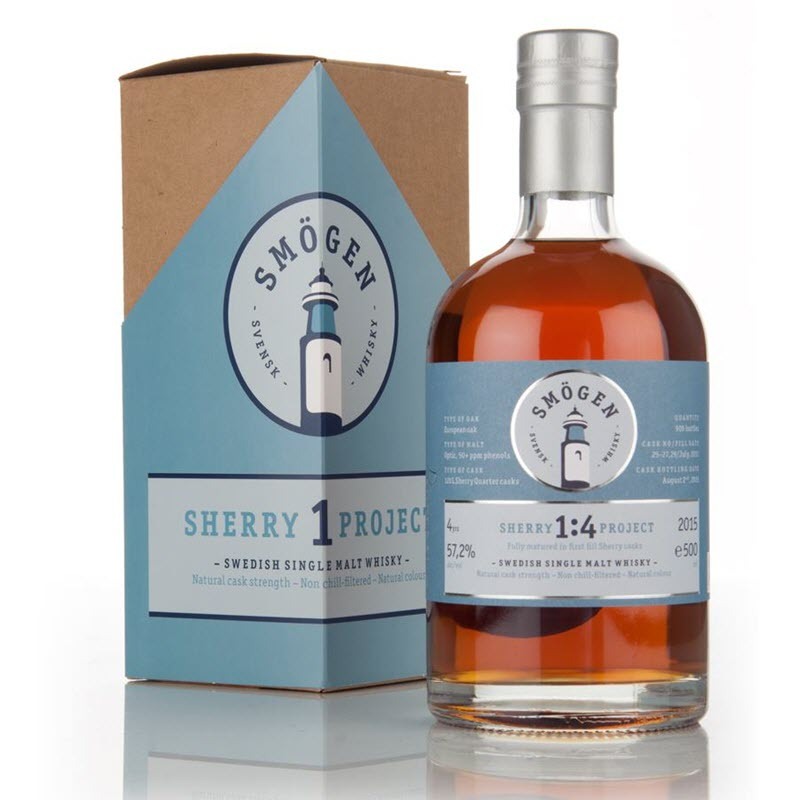 The Smögen Sherry Project 1:4 was distilled in July 2011, bottled on 2015-08-02, and released for sale on 2015-11-19. The total outturn was 640 bottles. The sales price was SEK 921 and it sold out immediately. You can read more about the sherry project and the first three installments here, here and here. Nose (23/25): Everything I loved about the nose on the Smögen Sherry Project 1:3, only taken up another notch. Amazing, young sherry matured whisky. Now certainly you can hide some young-ish notes with peat, and with sherry maturation. But when you also have a very nice new make as the base and select a very good cask you're golden. Dried fruits, red berries, unsalted peanuts, vanilla, caramel, sweet wood smoke, and something green. The green character might be pine wood mixed with soft herbal notes. Taste (21/25): Rich and full mouthfeel. Sweet and spicy. Lots of potent peat here, hot embers and wood smoke. A pine forest ablaze! Caramel, honey, nuts and oak. Finish (21/25): Medium long finish. Becomes a bit moregreen now. The pine is joined by eucalyptus and mint. More oaky as well now. Balance (22/25): A fine dram, for sure. I do prefer the 1:3 as the best in this range though. I felt this release was a bit youngish.